When I grew up and well into my twenties, my paternal grandparents lived across the street from the synagogue most of my family attended. We’d have most of our holiday meals at their house, everything prepared by my baba (grandmother) and served up by my mother and aunts. For most holiday and Shabbat meals at Baba’s, meat was on the menu. But to break the fast of Yom Kippur, we always went with a lighter, dairy meal. When services ended at the synagogue, my family would file out the back door and stroll the half-block to the house. Every single year, we’d be welcomed by the aromas of coffee brewing and freshly baked cinnamon rolls and blueberry or Saskatoon berry buns wafting from the kitchen in the back of the house to the entrance and living room. Dinner would be any combination of kugels, knishes, blintzes, fish, salads and other dairy dishes. But the one thing I remember the most was Baba’s Yom Kippur Soup. 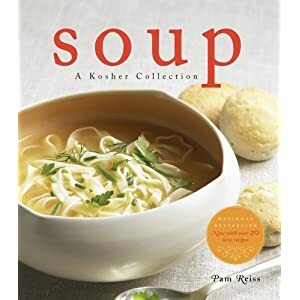 Once we were all gathered around the table, challah and the milky vegetable soup was always the first course. Now, though we ate this soup every year, it wasn’t always the same. It was always close, but the vegetables in the soup were determined by whatever was plentiful in the garden that took up her back yard. This recipe, Baba’s Break-the-Fast Soup, was first printed in my cookbook Soup – A Kosher Collection (2004 – Whitecap). Feel free to add or remove vegetables depending on your likes and dislikes or on whatever is fresh from your garden. Over medium-low heat, sauté the onion in olive oil for 2-3 minutes, stirring as it cooks. Add the carrot, celery and parsnip and continue cooking another 2-3 minutes. Add the stock and potato, cover and bring to a boil over high heat. Add the beans and mushrooms, reduce heat to medium-low and allow to simmer gently for 15 minutes. In a separate bowl, whisk together the flour and milk. Make sure the mixture is well blended and there are no lumps. Whisk the mixture into the soup and add the noodles. Bring the soup back to a simmer. Cook until the noodles are tender and add the dill, salt and pepper. Taste and adjust seasoning if necessary.